DAVID BOWIE: HUNKY DORY: 1971: 5 STARS OUT OF 5 STARS: My favorite Bowie album. Bowie had fully arrived as an artist. Still hadn’t broke in the US though- the album went to #57 and Bowie’s Changes- his signature song only went to #66. In 1975 as a re-release it went to #41 so this classic didn’t even hit the Top 40 in the US. Hard to find fault with any of the album- from Changes to my favorite Bowie song “Life On Mars” Oh! You Pretty Things, Kooks, The Bewlay Boys. On the 1001 albums to hear list. NEIL YOUNG: ON THE BEACH: 1974: 5 STARS OUT OF 5 STARS:This was recorded after but released before Tonight’s The Night [like Abbey Road and Let It Be with The Beatles} Young goes through a dark period- I am betting at the time a lot of those who got on board with Harvest- were completely puzzled when they heard this. Walk On and For The Turnstiles are the songs from this album which made it on Decade a few years later. Revolution Blues is about Charlie Manson who Young had met back in the 60’s. Vampire Blues is a song about the oil industry. The album wasn’t released on CD until 2003. On the 1001 albums to hear list. 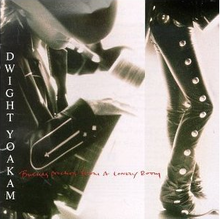 DWIGHT YOAKAM: BUENOS NOCHES FROM A LONELY ROOM: 5 STARS OUT OF 5 STARS: 1988: Dwight’s third album in three years and another one he knocked out of the park. Contains his only 2 #1 hits- the great duet with his hero Buck Owens and I Sang Dixie. Another single I Got You went to #5. A cover of Johnny Cash’s Home of The Blues and Floyd County are also standouts and the title track which as a single failed to make the country Top 40. On the list of 1001 albums to hear. ANNE SOFIE VON OTTER AND ELVIS COSTELLO: FOR THE STARS: 2001: 3 STARS OUT OF 5 STARS: First off the album is too long at over an hour and second it is more of an Anne Sofie Von Otter album than an EC album. Von Otter is a classical music singer. Elvis wrote some of the songs here and produced it etc. This is more accessible than the album with the Brodsky Quartet though- A curious period of Elvis career three albums in a row- since All This Useless Beauty he made a sharp turn away from rock music- collaborating with Burt Bacharach, Brodsky Quartet and now Anne Sofie Von Otter. Of the three the best is Painted From Memory with Bacharach. He would get back to rock on the next album. 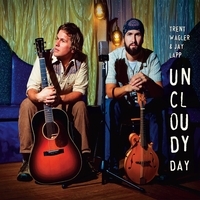 TRENT WAGLER & JAY LAPP: UNCLOUDY DAY: 2010: 3 1/2 STARS OUT OF 5 STARS: Wagler and Lapp of The Steel Wheels- with their instruments in a room with one microphone playing traditional songs. Good stuff but not as good as their original songs with The Steel Wheels. DAVID BOWIE: THE RISE AND FALL OF ZIGGY STARDUST AND THE SPIDERS FROM MARS: 1972: Bowie’s most famous album- and maybe his best- how do you choose? 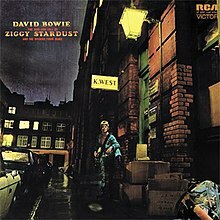 A concept album about Bowie’s alter ego Ziggy Stardust- the most famous of all the characters Bowie would play in his career. Five Years, Moonage Daydream, Starman, Lady Stardust, Suffragette City, Rock and Roll Suicide among the many highlights. One of the most celebrated rock albums ever- and of course is on the 1001 albums to hear list. Looking over the critics grades its 5 stars or A plus across the board except of course for The Dean of Rock Critics Robert Christgau who gives it a B plus. 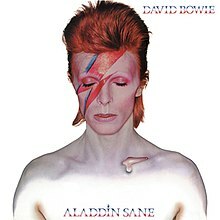 DAVID BOWIE: ALADDIN SANE: 1973: 4 STARS OUT OF 5 STARS: Maybe the most famous Bowie album cover- that or “Heroes”- the album itself was the biggest hit to date in the US for Bowie #17. The albums is good but kind of a let down after Hunky Dory and Ziggy Stardust. Watch That Man, Panic In Detroit, The Jean Genie highlights- including a cover of The Rolling Stones “Let’s Spend The Night Together” does suggest he was a little short on material at the moment. On the 1001 albums to hear list. 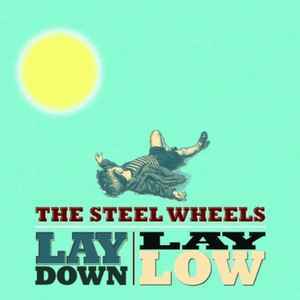 THE STEEL WHEELS: LAY DOWN LAY LOW: 2012: I saw this group a number of times during the first part of this decade- 6 or 7 times. This was the first new album they released after I ‘discovered” them and it is a good example of their work- 12 originals from this Harrisonburg, VA band- it was their 4th album together and has a varied material from ballads to mid-tempo songs. Just my opinion but I don’t think they have matched this since. They are at their strength when they get everyone involved. There are a lot of bluegrass elements on Steel Wheels albums but I wouldn’t classify them as a bluegrass act- file under Americana. Awesome.. Steel Wheels are probably hard to find. I can see that. I got their CD’s at their shows- I’ve never seen one anywhere else.